Snapchat is a social networking/photo sharing service released in September 2011. It was developed by Evan Spiegel and Robert Murphy, then Stanford University students. The app rose to fame in an incredibly short time, thanks to its easy, hassle free sign-up process, simple user interface and most importantly, self-destructive messaging system. Users are enjoying the experience that may not be possible on other services. Self-destructive messages means that the app won’t eat up memory–unlike Instagram that can take up 700 MB to 1 GB (depending on usage frequency)–which frustrates a large number of users, especially app-fanatics or those with limited memory space. Once viewed for a limited time (1-10 seconds as designated by senders), the photos are deleted on both ends. Senders are notified when their Snaps are screenshot by receives, which contribute to the privacy and anonymity that users find in Snapchat. Sign-ups only require new users to provide screen names and passwords, without ties to any other social platforms. This may also contribute to the app’s success, seeing how most online social services nowadays encourage users to sign-up with, or connect to their Facebook and Twitter accounts, as an attempt to reach their networks. The younger generations are, said Facebook chief financial officer David Ebersman, using Facebook less than before. This graph, with teen usage data on social media, presented by Huffington post shows a sharp dip in Facebook usage from Fall 2012 to Fall 2013. 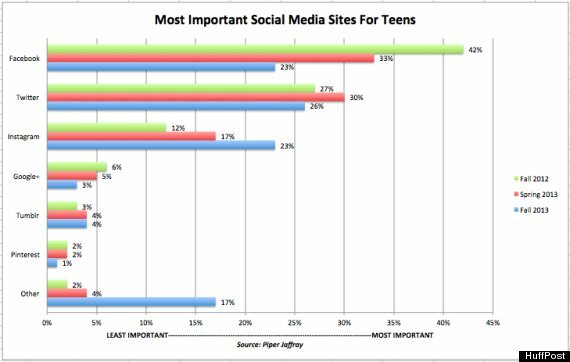 Experts speculate this phenomenon may be due to the fact that parents or elder family members now have access to Facebook, which discourage teens or young adults from visiting the site more often. Generation Y, or the millennial generation–social media main traffic-drivers–now comes to prefer micro-blogging services, either due to mobility, or lack of time (and attention span). Despite the known fact that 3 out of 4 start-ups fail, Snapchat seems to be growing roots on many handheld devices. 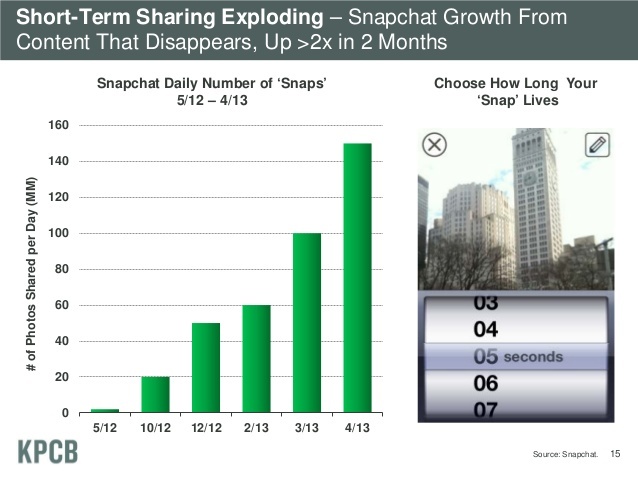 Data from KPCB–a venture capital firm–suggests that by April last year (2013), the number of snaps sent daily already went over the 140 millions, doubling that of February. 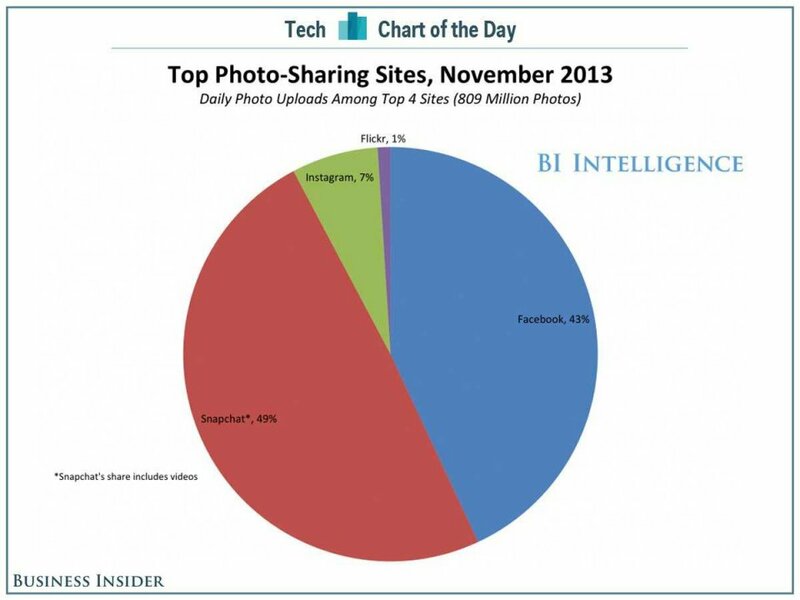 In terms of photo-sharing services, Facebook and Snapchat are in the top 2, winning over Instagram and Flickr. KPCB chart shows that Snapchat still has a long way to go before reaching number 1, though Business Insider suggests that Snapchat actually is accountable for half the amount of shared media online. 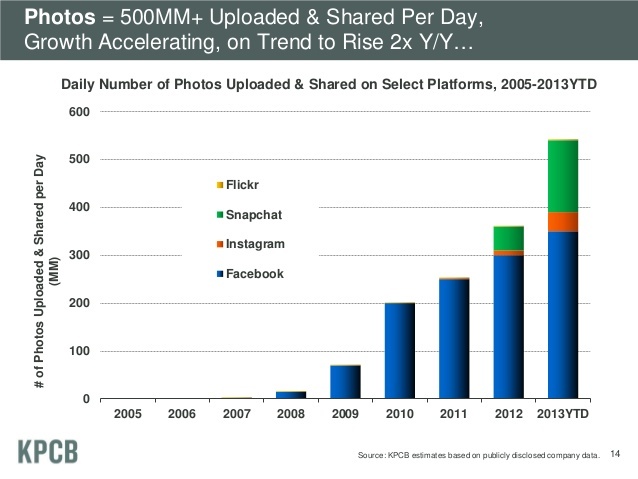 The difference between KPCB and BI’s data is probably because BI included the number of videos shared on Snapchat too. Either way, Facebook has got itself a rival. These datas only reflected 2013, so it’s hard to tell how the fast the competition is moving up to this point. In November 2013, news broke that Facebook offered $3 billions to acquire Snapchat, making analysts raise their brows at this over-valuated proposal. Snapchat is not worth that much, they said, as the app is not even monetized. What potential Facebook sees in this small start-up, only Mark and his team knows. They were however more confused and outraged as Spiegel declined the offer. They didn’t know what to think. Snapchat’s creator still maintained his point, as investors are still putting faith in the company. Some say Snapchat may even become the next Twitter. Monetization is not easy. People don’t like to pay for things. They don’t like ads, either. The key is not be unobtrusive. We need to deliver content that users find relevant, relatable and hopefully actionable (so they would click, share or convert). The content should be delivered in a well-calculated timing that naturally blends in with the user information stream. Essentially you want to make money, while providing the users with enjoyable services. In order to keep using Snapchat for free, they need to subscribe to at least 3-5 sponsored Snapchat accounts continuously. What this means is businesses, celebrities, products (virtually anything marketable) will have their own Snapchat accounts that will send out periodic updates to followers account. Since users get to decide what account to follow, they will most likely pick something of interests. Sponsored content would not be obtrusive. The opportunities are endless: businesses sending out coupons, promotions; celebrities send out personal updates, selfies. 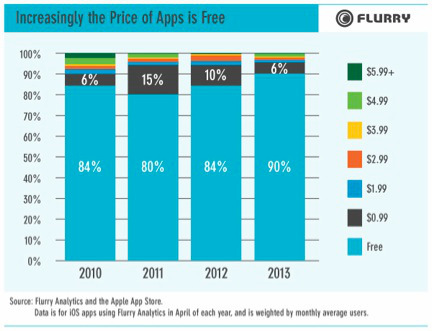 Users may or may not be willing to pay for apps, but statistics have shown that in-app purchases perform better. Compiled online suggestions came down to a few options that would catch users’ interest: longer snaps, send HD snaps, more filters, editing snaps before sending, importing snaps from camera roll. API–application programming interface–is how apps “talks” to each other. By integrating Snapchat’s API with that of Facebook and Twitter, we can build user profiles by cross referencing databases and linking different platforms’ account to one identity. Advertisers can then better know of the users’ preferences and demographics to send targeted ads. This, however, would require Snapchat users to link their accounts to Facebook and Twitter, which may compromise anonymity and privacy, which set Snapchat apart in the first place. Linking Snapchat to social media pages such as Facebook and Twitter might help Snapchat make money. Since then Snapchat will know what interests their users have and they can have advertisements that way. Also, the group that presented on Snapchat said that Snapchat was sending out promotional snaps for companies such as Taco Bell. I agree, because linking Facebook and Twitter means that the platform’s APIs would be integrated, helping Snapchat identify their users based on existing profiles. However, one could argue that linking these platforms together would undermine the reason people signed up for Snapchat in the first place: privacy, ease to sign-up and anonymity. Though many social media platforms allow for photo and video sharing, Snapchat is truly unique and has obviously found a niche amongst the overwhelming number of apps. I think that requiring users to subscribe to businesses or public figures as a way to monetize Snapchat will be very successful. I think people will actually enjoy this, just as they follow and like businesses on Facebook and Instagram. I think it adds another element to the platform that not only makes money for Snapchat, but also draw more people in. I agree. Paying for an app is not an option especially since it has been free this whole entire time. I agree with Emily that linking it with other social medias will help with making money. Maybe they can get investors or sponsors like Tumblr. I would take a different stance on linking it to other social media accounts. One of the best parts of snapchat is that it works off your phone book. This means, you can invite people off your phone book. Having it linked to facebook or other social media lends itself to open it up to the people you don’t want to know your snapchat info(requests from mom, that awkward guy from work). I agree that they have to find a way to tailor to peoples likes, but I don’t think its going to be through current social media outlets. I’m sure you’ve seen the new update that was released today that introduced messaging and live video chatting. I really like the ideas you’ve laid out here already and am interested if you have any new ideas that capitalize off the new features?